A very reasonably priced security suite comprising a top-notch password manager and encrypted file safe. The ability to hide one file (or a whole safe) within another is a great addition, and the option to save keychains and safes to the cloud makes it incredibly convenient. Highly recommended. 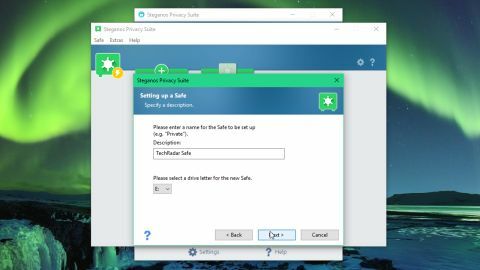 To celebrate its 20th anniversary, security software developer Steganos has rolled together two of its best tools – Steganos Safe and Steganos Password Manager – plus a bundle of other features. The result is Steganos Privacy Suite 20, and it's an impressive package. The password manager might not look quite as polished as LastPass, but it’s packed with ingenious features that are more useful than superficial gloss. The initial setup process will be familiar if you’ve ever used password management software before: create a keychain, the enter a master password to protect it. You can use a virtual keyboard to dodge any keytracking software that might be installed on your PC, select a series of pictures instead (a tool known as PicPass), or have Steganos Privacy Suite 20 generate a password for you (using upper and lower-case letters, numbers and special characters). Your password will be given a rating out of five, and you’ll be told how it might be possible for a criminal to crack it – a nice touch that’s more useful than a number alone. There’s also two-factor authentication available in the form of a QR code, which you scan using an authentication app on your phone, and you can store your master password on a USB thumb drive. Steganos also offers mobile privacy apps (for iOS and Android) which let you create and edit keychains on your phone – a handy addition you won't find in most password managers. Adding new accounts is a matter of entering your login details and the site’s URL (manually, or by dragging and dropping from a browser). Handily, there’s also space for notes and attachments. When you visit the site, your credentials will be filled in automatically. A widget will also appear, enabling you to easily enter your username and password by dragging and dropping them into the login fields. There are also browser extensions available to make things even easier. As well as site logins, it’s possible to store bank account and credit card details for managing your money and shopping online, create a private list of favorite sites that will only be accessible when you’re logged into your master account, and personal details like names and addresses for completing contact forms automatically. If that’s not enough, you can also transfer your encrypted keychain to Dropbox, Google Drive, Microsoft OneDrive, or MagentaCLOUD, enabling you to access them on any device. It’d be nice to see support for other forms of two-factor authentication (like YubiKey, for example), but that might come in a future update. Steganos Privacy Suite 20 also lets you lock away sensitive files in an encrypted virtual safe. You can create a safe on your PC, network-attached storage, on a cloud storage service, on a USB drive or optical disc. You can even use a whole drive partition as a safe, though you’ll need to create the partition before launching the software, and make sure it contains no data you want to keep. If you’re creating a safe on your PC, you’ll be prompted to give it a name and a drive letter, and choose where it will be stored. You can set a fixed size for your safe, or let it grow dynamically as you add files. Finally, as before, you’ll need to enter a password to unlock it. Creating the safe might take a little while, but it only needs to be done once. Once that’s done and you’ve logged in, you can use it like any other drive, adding and removing files at will (where they will be encrypted automatically). When you log out, the safe will ‘vanish’. For even more security, you can hide a safe, or a collection of files within another file (known as the ‘carrier’) - a process called steganography (hence ‘Steganos’). It’s an extremely handy way to keep confidential files private – and to ensure your important work isn’t accidentally deleted if you share a PC. The process is entirely wizard-driven, and guides you through each stage. In addition to the password manager and secure safe tools, Steganos Privacy Suite 20 also includes a secure file shredder, a tool called TraceDestructor to remove browser history and cookies, and quick access to options for deactivating your webcam, blocking ads and tracking cookies, and anonymizing your browser type. These aren't exclusive to Steganos Privacy Suite 20, but it's handy having them all in one place, and makes it much easier to maintain your privacy if you use multiple browsers. All in all, Steganos Privacy Suite 20 is a superb security package, and at $59.95/£49.06/AU$87.91 it's very reasonably priced too.